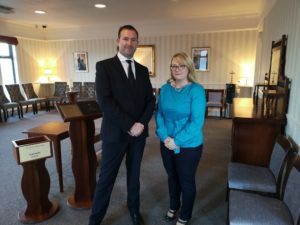 The Gleasure Family were delighted when the opportunity to purchase the O’Carroll’s Funeral Home in Greenville, Listowel presented itself. They look forward to serving the needs of families in and around Listowel in a professional and caring manner. Funeral Home Manager in Listowel. and patience are what is needed most. that displaying photographs may give tremendous comfort to the bereaved at the funeral home, and an information screen is useful to display family photos or details about the arrangement times or donation choices. “We offer a service where the funeral can be viewed online by family in Ireland or abroad” says Seán. This attention to detail enhances the unique service offered by the Gleasure Funeral Homes in Tralee and Listowel. To read more about the Funeral Home and the gleasure family, click below.